You get an idea, it’s got energy, you need to act. Do it, finish it. Put it out. Move on. When things drag on, it gets harder. You have to find the energy and the will to finish things from somewhere else. It doesn’t have the same meaning any more. You’ve changed, but the thing hasn’t. It just remains. Losing its meaning. Becoming dead. Arg g g h h h h . . .
I’m VERY familiar with the second. 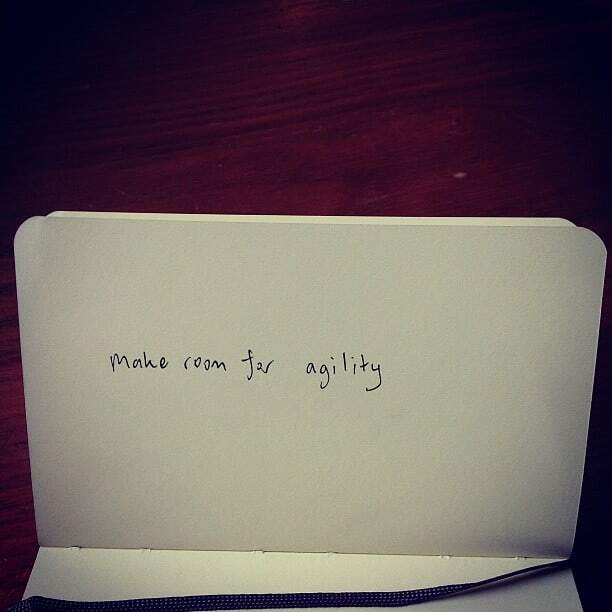 And in thinking about how to overcome that, I try to make room for agility. Space for things to happen quickly. Letting the band members contribute. Giving them space to do stuff. Leaving things till the last minute. Getting together with someone, aim to make a track – the deadline is to invent, record and release it on the same day. Improvise something, put it out. Do you notice the places where you go over the same ground? The places where you’ve had the same thought again and again. How could you change it to make things happen quickly?